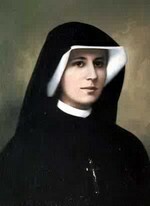 The message and devotion to Jesus as The Divine Mercy is based on the writings of Saint Faustina Kowalska, an uneducated Polish nun who, in obedience to her spiritual director, wrote a diary of about 600 pages recording the revelations she received from Jesus about God's mercy. Even before her death in 1938, the devotion to The Divine Mercy had begun to spread. The message of mercy is that God loves us, all of us, no matter how great our sins. He wants us to recognize that His mercy is greater than our sins, so that we will call upon Him with trust, receive His mercy, and let it flow through us to others. Thus, all will come to share His joy. It is a message we can call to mind simply by remembering ABC. 1. Ask for His Mercy. God wants us to approach Him in prayer constantly, repenting of our sins and asking Him to pour His mercy out upon us and upon the whole world. 2. Be merciful. God wants us to receive His mercy and let it flow through us to others. 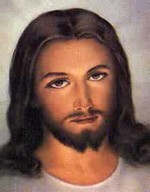 He wants us to extend love and forgiveness to others just as He does to us. 3. Completely trust in Jesus. God wants us to know that the graces of His mercy are dependent upon our trust. The more we trust in Jesus, the more we will receive.